Amaro Montenegro is so rich from the sensorial and flavor point of view that it can be enjoyed in a variety of ways: perfect after meals, straight or on the rocks, but also for revisiting classic cocktails and crafting innovative and refreshing drinks with a one of a kind personality. Shake and strain into a coupe (cocktail) glass garnish with a lime wheel. Pour ingredients into an ice-filled Collins glass and stir briefly. Top with champagne, and garnish with a lime wheel and a pinch of salt. Shake and strain into ice-filled rocks glass. Pour ingredients except soda water in an ice-filled Collins glass and roll over ice. Top with soda water and garnish with an orange slice. Coat the brown sugar cube with the root beer bitters in a rocks glass and muddle. Add the liquid ingredients and stir. Add one large ice cube and stir again. Garnish with an orange peel. Muddle sugar and fruit slices in the bottom of a shaker. Add liquid ingredients, shake over ice and strain into a Collins glass filled with crushed ice. Top with more crushed ice and garnish with a mint sprig and orange slice. Are you ready to be the vero bartender? 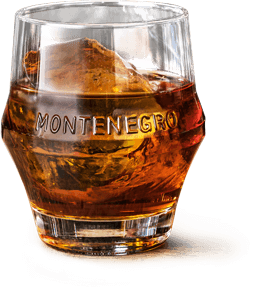 Produced and bottled by Montenegro Srl.